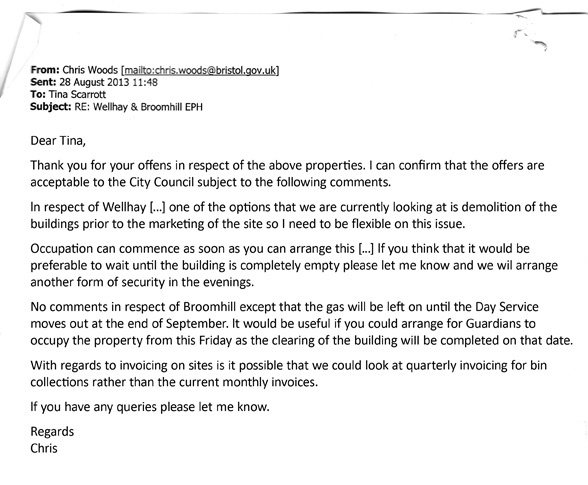 Here’s documentary evidence of OPEN CRIMINALITY in Bristol City Council’s Property Services Department. The email published above is from the city council’s Chris Woods, the Principal Portfolio Management Officer (Asset Strategy). It BRAZENLY invites Camelot, the dodgy property guardian firm, to take control of an empty local authority building for free and house vulnerable people in it despite it having no HMO (House of Multiple Occupation) licence. Housing people on this scale in this size of building without an HMO licence is a criminal offence. It also demonstrates an utter and – potentially – deadly disregard for the safety of any tenants in the building as there is no evidence and no oversight that the building is fit and safe for human habitation. WAS WOODS HAPPY TO MURDER THE POOR? In the light of Grenfell Tower shouldn’t Mr Woods be prosecuted for deliberately endangering the public in order to save a few quid and help his promotion prospects?